The first major auto show of the New Year is upon us and this is your complete guide to all the new cars and concepts making their world and North American debuts in Detroit. The 2018 North American International Auto Show (NAIAS), which is just as often called the Detroit Auto Show, takes place in downtown Detroit at the Cobo Center. International press days are held on January 14 to 16 with public access running from January 20 through 28. While, admittedly, the number of premieres hosted in Detroit has declined over the years, as the Los Angeles and New York auto shows gain more and more traction with carmakers in America, the NAIAS remains one of the most important automotive events on the continent. This year, we’ll see a parade of notable concept and production car debuts ranging from the renewed VW Jetta and Toyota Avalon sedans to the BMW i8 Roadster and the Infiniti Sedan and Lexus Flagship SUV studies. Naturally, it wouldn’t be 2018 without trucks and SUVs, with debutants including the first new generation of the iconic Mercedes-Benz G-Class in three decades, the next Chevrolet Silverado and the Acura RDX prototype. We’ve compiled a preliminary list of the definite as well as whispered 2018 NAIAS premieres in alphabetical order below, which we’ll keep updating on a daily basis as the show approaches and news becomes available. 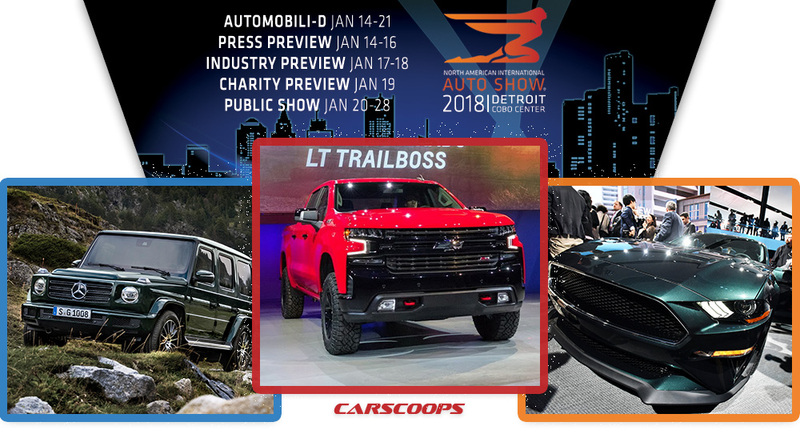 0 Response to "2018 Detroit Auto Show (NAIAS) A-To-Z Debuts"